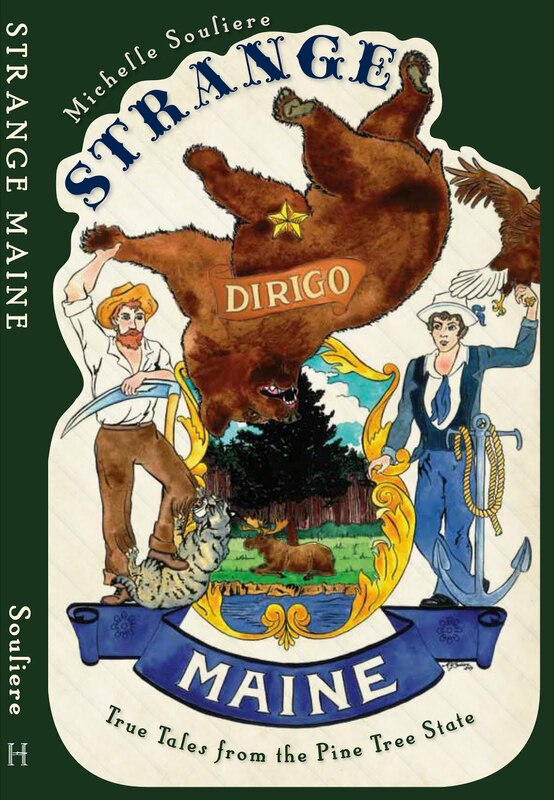 Strange Maine: Rowdy canoeists ruin river? Imagine my surprise and amusement to read this sentence on the WCSH TV-6 website: "The Fryeburg police chief is promising to bolster patrols along the Saco River, which is known for rowdy behavior of some canoeists." Rowdy CANOEISTS? Somehow this doesn't seem compatible with my mental image of lazy paddling on sunny waters. However, there seems to be a long history of battles between those who want to enjoy the Saco River in peace and those who want to whoop it up. The article mentioned above was posted earlier today, but this has been going on for a long time. Remember, legend tells us that it was rowdy guys in the summer of 1675 that caused the Curse of the Saco River to be passed down over the next three centuries and more. Might it not be good to pay attention to the warning signs, fellows? 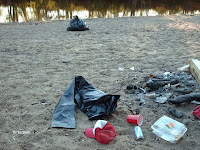 The images here show the sharp contrast between the natural beauty of the Saco River and the use which partiers put it to. 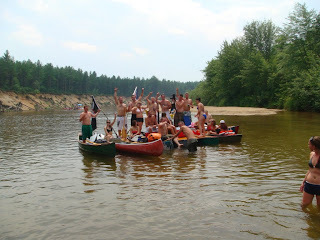 Please note the goat being held up by the riders of the typical example of a Saco River party barge. I really don't want to know what they were doing with the poor thing (click on photos to see larger version). 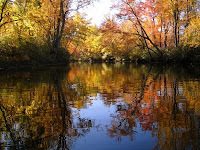 Photos are from the Saco River Recreational Council. Yeah, ow! Big time. Not so funny. Not at all. The Saco River Recreational Council (source of all the photos shown here) has been fighting for years to make the river usable for all those who want to enjoy it, and are the ones funding the new patrols. For those of you curious about the history of this controversial river use struggle, here are a few more past selections to set the waters of thought and discussion flowing. FRYEBURG, Maine -- It is an annual problem on the Saco River rowdy, intoxicated canoeists vandalize campgrounds, argue with locals, and leave piles of litter behind. This year's spate of alcohol-related incidents, including the drowning death of a Massachusetts man, have some residents renewing the cry for a crackdown on such behavior. In July, police were called after swearing, drunken canoeists climbed ashore to a boys' summer camp in Fryeburg, then physically threatened the counselors who asked them to leave. Only days later, members of another intoxicated group were angry about fees charged for a campground threw picnic tables into a bonfire and shoved a park employee. 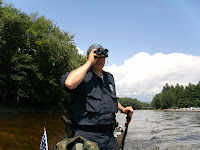 Last week, Edward Landry, 35, of Somerville, Mass., was found drowned in the river by several kayakers. He had been camping with about 14 people on the river and had been heavily drinking, said Mark Latti of the Maine Warden Service. The Saco River became a hot tourist spot for paddlers about 15 years ago, and a handful of alcohol-related incidents occur every summer. But authorities say rowdy drinkers are a tiny fraction of the paddlers, who primarily come from other parts of Maine, New Hampshire, Vermont and Massachusetts. I would say things haven't gotten much better. We'll see what happens this summer. It's too bad that grown men and women who are supposed to be adults act like 10 year olds. A lady he is not! The coffee brandy quality of life? Mainer finds oldest unfound geocache! Watch out for falling moose!